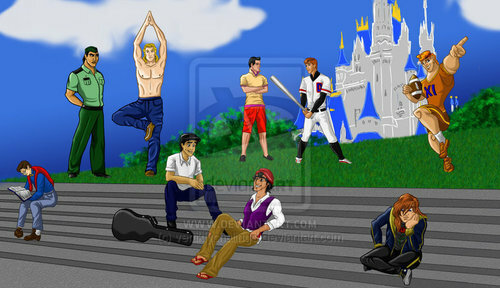 disney Princes at School. I cinta that Eric is the musician <3. Wallpaper and background images in the disney Prince club. LOL @ JOHN SMITH & BEAST. I love Eric as a musician, too! And Aladdin is great as the class clown! Oh sweet Heaven!! Who made Adam goth??????? It makes since that Shang's in military school. It also makes strange since that he's checking out John Smith.